Hello my friends, it took me a long time to write this post as I spent some time traveling. But here it is…. you might wonder about this strange title…. 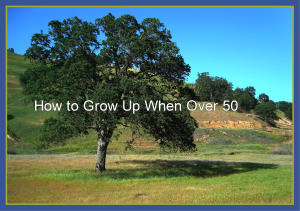 Normally people at 50 and over should be grown up… But guess what… there are many occasions when that is not the case, actually I would say that most “normal people “are emotionally immature, which is another way to say not grown up. I know because it´s part of my story… So… why is that? I constantly meet new people in 12 step programs, personal development seminars, meditation courses and other events and places where people might go when they are not happy with themselves and or others. Naturally there are many middle aged and older human beings over 50, who think of themselves as the eternal victims, children that have been harmed and adults that have been wronged. Yes, yes and mostly that is the truth…. but the problem is that if you always thinking of yourself as a victim, you are not willing to take responsibility for your own life and that is painful. Through my own experience of feeling like a victim and you guessed right: I was around 50. That´s when I was ready to learn that I can only grow up and be content and fulfilled when I am willing to take responsibility for my life and stop complaining and blaming….ouch. Blaming others for my misery and unhappyness, instead of leaving a situation that was not healthy for me, taking my life into my own hands and just moving on to pursue the things I was interested in. Finally it happened and guess what, I was 50 and it was very hard. There might have been a softer way to do it, but the way I did it was very painful. So painful that my therapist at the time begged me to go on antidepressants, because he was afraid I would harm myself…. Well for whatever reason, I needed to go through this pain and eventually got out of the dark into the light. I totally changed my life, took up a new career that I loved, changed my environment. After a while I let go of toxic people whenever I could and limited contact with negative people as much as possible. I still chose to have contact with some… like close family members, but in a detached way, accepting them the way they are and not expecting them to change. It´s a process of letting go, accepting, learning and it feels good that way. I felt like the victim most of my life, but eventually when I understood that it´s not good for me. The way I saw the world was different and oh my god it changed my life. Whenever I don´t like what others say or do, I always ask myself why it upsets me and normally I do the same thing myself. Who is making you feel good? Who is making you feel bad? What´s a mess in your life? What are you constantly complaining about? The answers to all these questions will give you clues about your life. First you start with accepting the fact that it is whatever it is. Which does not mean you give up, it means that you accept the things you cannot change and change the things you can. In order to do this you have to get quiet enough that you can actually tell the difference try a simple meditation practice that will help you. The next step is to find simple solutions to start eliminating the energy drains and messes from your life. Sometimes it´s hard to do this, it hurts people when you don´t want to spend time with them, but it will be worth it. If people drain your energy, limit exposure. Life is always changing and nothing will ever be the same. Human beings have a hard time to accept this and want the opposite, to stay in their comfort zone and keep everything the same, but it´s actually outside of your comfort zone where a fulfilling life begins. I would like to invite you to try it, move out of your comfort-zone into a new adventure, be willing to experiment, be grateful for whatever reasons you can find to be grateful for, it´s a simple practice that can change your energy in a second. Oh and one more thing…observe your thinking and whenever you catch yourself thinking in a negative or mean way, just drop it and replace it with something that feels good. Are you willing to try? I love to read your comments, please let me know your thoughts and how YOU take responsibility for your life, how do YOU change your energy? 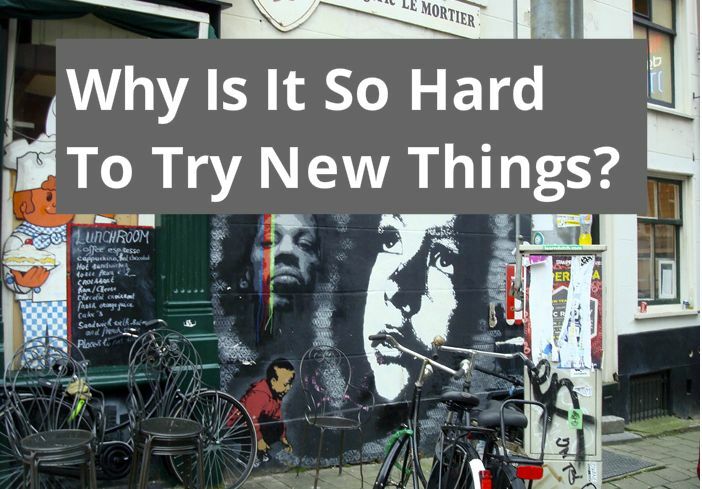 Why Is It So Hard To Try New Things? Why Is It So Hard To Do New Things? How do YOU feel when you desire to make changes in life. Do you feel ecstatic, do you feel anxious, or do you you feel neutral about it? The fact is that changes are very hard for most people, that's why they rather stay in painful situations. Even if the change comes with the promise of a great life, it gets ignored and pushed onto the "famous back burner." Do YOU know "someone" who stays in a miserable job, a bad marriage, hangs out with friends who are not a pleasure to be around, but holds on and on and complains and complains, but does not do anything about it? Why is that? Sometimes the job isn't even paid well, so what the heck is going on? Could it be security, or better said the illusion of security? The job might be gone tomorrow, the company might be downsizing, the owner might be changing, the new boss might not like you. Job gone anyway…………………there is no security and it's better to face it. Knowing this might help YOU with stepping out of YOUR comfort zone and experiment with new things. Maybe it's looking for another position, maybe it's finally creating the business YOU always wanted to have. Yeah why not, it's good to face the fear head on and do it. Life is short and too precious to be lived in comfortable misery. Find some helpful tips below, to be more courageous and start to initiate some life changes, even small ones. It is very hard to do it alone, YOU need to have people who believe in YOU and support YOU. I myself initiated several major life changes in my life. When I was 24 I moved from Germany to California, started 4 businesses. Around 52 I left my husband, started on a quest to find my life purpose and moved back to Germany when I was 58. Every little step was scary as hell, but I did it and know that YOU can do it too. Overcoming the fear and the resistance is the first step……………..This sounds weird but it's true, the fear and resistance will always be there, so there is nothing to get rid of or overcome. The only thing that can be done is to not let it stop YOU. The more experiments YOU make the more empowered YOU will feel. Really…. what do you have to lose, there is not security to hold on to, it’s an illusion. Try a session with me and find out if YOU might get inspired to discover something new. Go to the contact tab and e mail me to schedule a 2 part session, it's my gift to you. I can't wait to meet YOU. Author MaritaPosted on December 17, 2014 December 17, 2014 Categories EmpowermentTags business coaching, comfort zone, courage to change, empowerment tips, how to achieve life goals, how to achieve your life dreams, life changesLeave a comment on Why Is It So Hard To Try New Things?